With some of the cheapest meal prices in town coupled with big, bold signage that stands out from blocks away, Mystic Grill & Bakery is difficult to ignore. 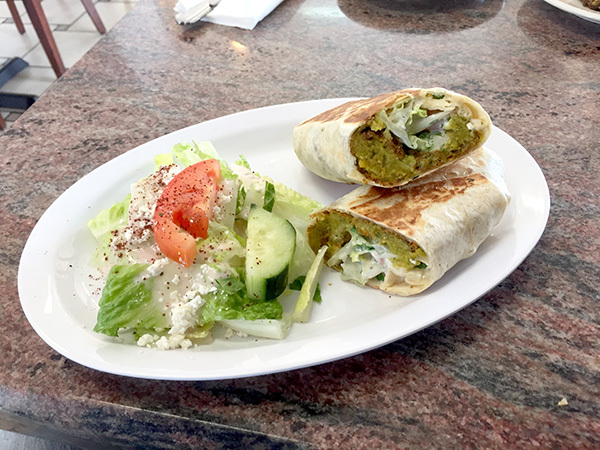 Located advantageously on the corner of University Avenue and 70th Street, the fast-casual restaurant has been serving up Mediterranean-inspired food for 11 years. Yes, there are the obvious choices such as Greek-style salads, hummus, gyros and kabobs. But you’ll also find things like kibbeh, which are crunchy Arabic croquettes encasing ground beef and onions, plus assorted meat pies of Levantine origin filled with spinach, beef or chicken shawarma. The kibbeh and meat pies are only $1.99 each. There’s also pizza using house-made dough. Remarkably a 14-incher with two toppings sells for $5.95 — less than what many frozen, commercial brands cost. Their aromas initially hit your nose upon entering the place, just as your eyes lock onto those gorgeous cones of gyros and shawarma sitting on spits behind the order counter. 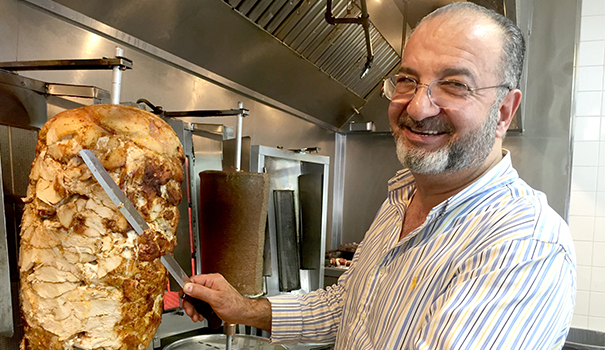 Mystic Grill & Bakery’s Syrian co-owner, Kamal Laila, oversees the kitchen. He’s been in the food industry for 30 years, having cooked in eateries while growing up in his homeland, and then owning and operating restaurants in Baton Rouge when coming to the U.S. 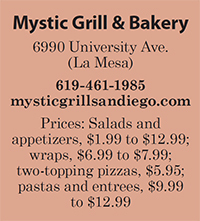 He ran a second location of Mystic Grill on Fletcher Parkway in La Mesa but recently closed it for an upcoming offshoot he’ll open on Balboa Avenue in Kearny Mesa in about two months. I kicked off a midday lunch with two kibbeh constructed traditionally with sturdy bulgur wheat casings. 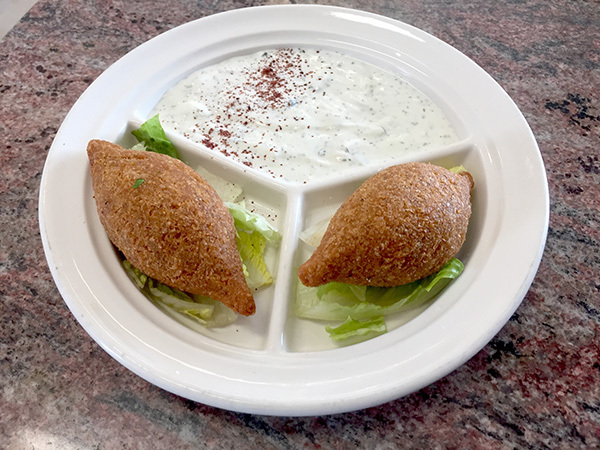 With kibbeh I’ve encountered elsewhere, the ground beef inside is usually lightly seasoned. Yet in this case, the meat was so under-spiced that the earthiness of the wheat shells took center stage and even dominated the accompanying yogurt sauce, which seemingly contained mint and cucumber. A meat pie filled modestly with chicken shawarma was my first introduction to the house-seasoned poultry that is sliced directly from a sumptuous cone of all-white meat. It prompted me to order a plate of the shawarma by itself. The robust flavors of fennel, smoky paprika, cinnamon, salt and cayenne pepper duly compensated for the dryness of the chicken, which sported crispy edges reminiscent of those tasty end pieces you find on roast beef. A falafel wrap with the addition of feta cheese inside needed a boost from garlic sauce since the fried chickpea balls tasted cumin-deprived. But the sauce lacked flavor too, as I could barely detect any garlic in it. So I resorted instead to a little cup of hot sauce with some mysterious seasoning in it (maybe tahini), which gave the wrap a decent zip. On the plus side, it’s a weighty item with plentiful fillings for only $4.99. 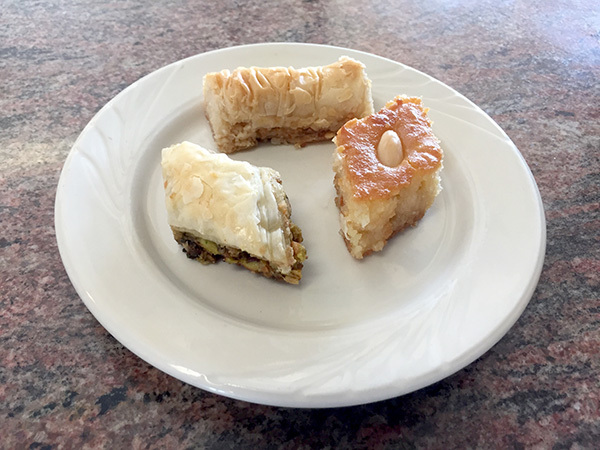 I concluded my visit with a small plate of finger-sized desserts: two types of baklava, one made with pistachios and the other with almonds; and a miniature square of harisa. The latter is an Arabic cake combining cream of wheat, yogurt, fresh coconut and honey. The merged ingredients create a distinct flavor that sort of resembles a juicy sugar cookie, if one ever existed. As for the baklava, both pieces were flaky on the outside and moist and nutty inside. Mystic Grill’s large, pictorial menu hangs over the order counter and visually entices you with substantial entrees and combination plates as well. Those offerings average around $11 each and include beef or veggie moussaka; salmon or jumbo shrimp over rice; pasta with a choice of seafood and sauces; and kabobs of beef, lamb or chicken served with rice and salad. The triple-storefront space offers ample seating at granite-topped tables. Vivid, framed paintings of Mediterranean landscapes occupy the walls and correspond well to the assorted foods from multiple countries that inevitably end up in your mouth.